(CNN) – The nation's largest tea party political action committee swiftly praised Mitt Romney's selection of Paul Ryan as his running mate on Saturday. The Tea Party Express said the House Budget chairman is a favorite among activists - despite Ryan's past support for two federal measures that, arguably, inflame the most anger among tea partiers. "Ryan is a strong fiscal conservative, and he has used his Chairmanship of the House Budget Committee to address the serious financial woes facing the country," Tea Party Express Chairman Amy Kremer said of the House Budget chairman in a statement. "Selecting someone like Paul Ryan, who is so popular with tea party activists, proves that Mitt Romney is committed to addressing the economic issues that have been troubling our nation for the last four years," Kremer added. "I think this was really bold of them to do this," Kremer said separately to CNN. Ryan has long been popular with economic conservatives for pushing tea party ideals. Most notably, his House budget proposal aims to reduce the nation's debt and deficit. The controversial $3.5 trillion plan would slash spending and reform Medicare and Medicaid. Ryan has also long been vocal about reducing taxes. However, Ryan supported two measures that tea partiers have always despised: the 2008 bailout of the financial industry and auto bailout passed that same year. The tea party largely formed in 2009 based on acrid opposition to those measures. Since then, many activists nationwide have campaigned against politicians who supported them – believing both measures grossly added to the nation's economic ills. In a 2010 interview with The Daily Caller, Ryan defended those votes. "I believe we were on the cusp of a deflationary spiral which would have created a Depression," Ryan said of his TARP vote. "If we would have allowed that to happen, I think we would have had a big government agenda sweeping through this country so fast that we wouldn't have recovered from it. So in order to prevent a Depression and a complete evisceration of the free market system we have, I think it was necessary." On his vote for the auto bailout, Ryan explained: "The president's chief of staff [Josh Bolten] made it extremely clear to me before the vote, which is either the auto companies get the money that was put in the Energy Department for them already …or the president was going to give them TARP, with no limit." "I said, 'Well, I don't want them to get TARP…We don't want to expand it. So give them that Energy Department money that at least puts them out of TARP, and is limited.' Well, where are we now? What I feared would happen did happen. The bill failed, and now they've got $87 billion from TARP, money we're not going to get back." CNN asked Kremer to square tea party praise of Ryan against his support for the bailouts. "There's no one up on Capitol Hill who has an impeccable record," Kremer said, emphatically stating that the movement is not giving Ryan a pass. "Paul Ryan is a conservative. He is willing to take those bold steps to get America back on track to prosperity. And he understands it cannot be done without entitlements." Now the Rich finally has their two Rs – RICH RELIEF! Another racist radical Tea Partyer that want to take away from the middle class and the poor and give to the rich. Mitt Romney is an unemployed rich puppet that was chosen millionairer. 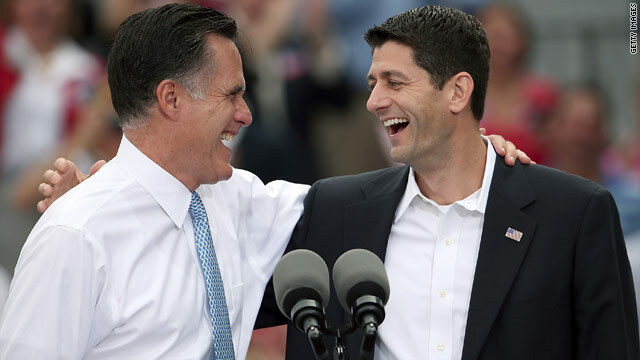 Romney/Ryan two strong gentleman, that will put this country back onto the road to greatness. Unlike Obama who has turn this country into a big goverment welfare nation. Obama has done nothing for 4 years outside of hurting the working class, by taking their hard earn money in taxes and giving it to the welfare crowd. Wow, Romney and Ryan. The 2 r's. Rob me and rob me again. Progressives who oppose the Romney/Ryan ticket prefer 15+ TRILLION in debt ... America turning into a third world country ... and, our children inheriting a bankrupt nation. Ryan is a good fit. Two fically responsible people running. I for one have given Mr. Obama enough time. We need to take care of America's fiscal problems, if not too late already. I must deviate from pullind the D lever and do what by brain tells me, get in people that can balance the books, like I need to do every month to keep from losing my home. Vote Ron Paul and be done with this nonsense.